Opel Astra/Vauxhall Astra. 2015 to date (prod. n/a). 5-door saloon, 5-door estate. F/F, 998 cm³ (I3 DOHC), 1399, 1598 cm³ petrol, 1598 cm³ diesel (I4 DOHC). 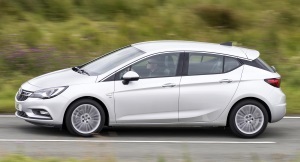 Opel ups the game, with a more substantial, complete Astra. Far more refined, better handling with suspension leaning toward firm, and excellent build quality. Lighter by 200 kg compared with outgoing model. GM OnStar on higher models provided real-time, human help as well as mobile wifi. Succeeded the Holden Cruze (née Daewoo Lacetti) in Australia, as the Holden Astra. Estate followed later in 2015. Change out the grille and front bumper, and it became the Buick Verano hatchback for China.